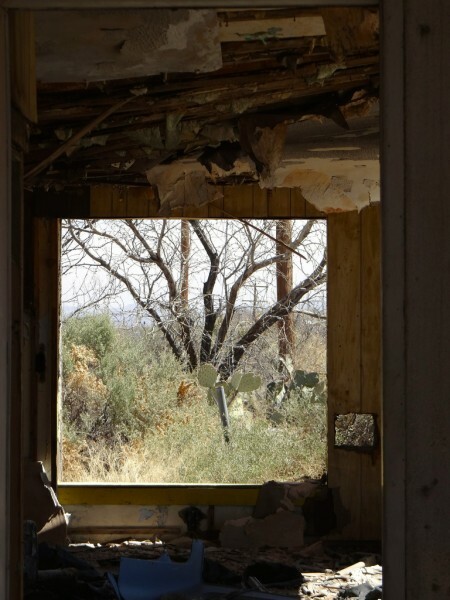 "The car speeds ahead, past crumbling clapboard houses and deserted strip malls, and under rusted and rickety bridges. There was a time, Ralf thinks, when society marked its progress on the physical landscape, building skyscapers, the Golden Gate Bridge, the Eiffel Tower, even simple and stately porched homes, like his grandparents’ place in Montclair. But in the last half century or so, most of the landmark projects have been virtual.... For most Americans, he thinks, progress is defined in software apps. The physical Oklahoma looks abandoned." 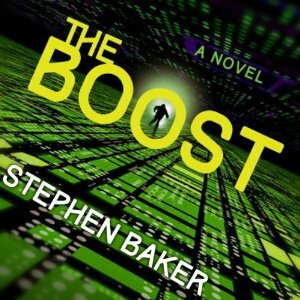 Kirkus on the Boost: "an exquisite thriller on the Mexican border"
My publisher, Tor Books, just released an excerpt of my upcoming novel, The Boost. It's also on the Amazon and B&NWeb sites. I'll cut 'n paste below. 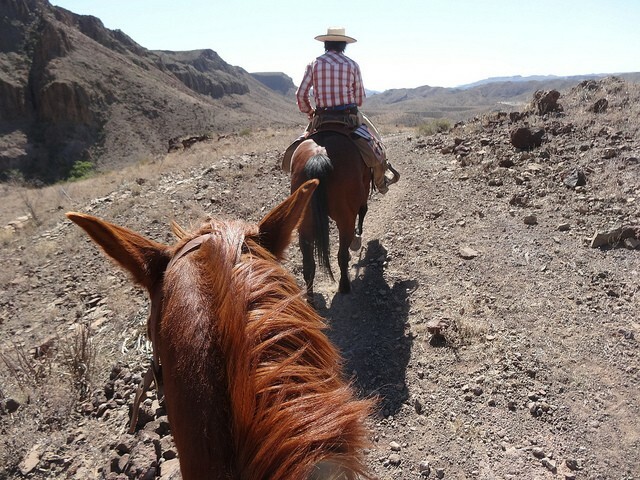 As the book begins, Ralf and his girlfriend, Ellen, are on their way from Washington, DC to El Paso. Ralf has recently had his cognitive implant, or boost, ripped from his head. He's newly "wild," and very unhappy about it. And he's being secretive about it with Ellen. 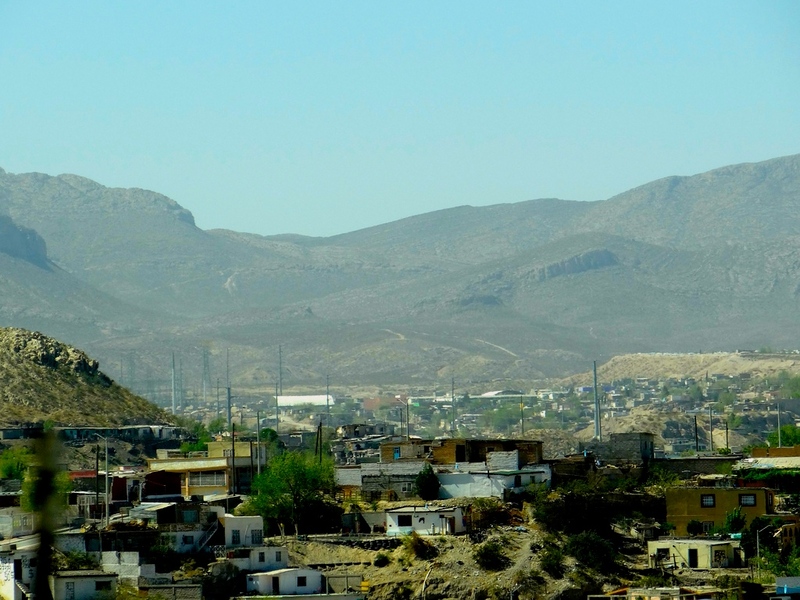 The photo, above, incidentally, is a shot I took out the car window of Juarez as we were motoring down I-10 on the west side of El Paso a couple of weeks ago. I took a lot of pictures down there and in the Big Bend, and I'm planning to use them to illustrate a big social media push behind this book. Since much of America in The Boost is something of a post-industrial wasteland, I tended to focus on the decrepit, forlorn and wind-swept in this swing through West Texas. I don't want to overdo that side of things, or people will think it's grim. I don't think of the book that way all. 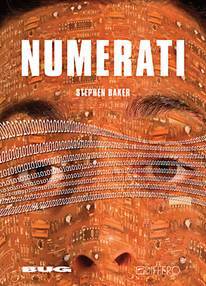 In fact, it wasn't until I'd finished writing what I thought was a cheery brand of sci-fi that I learned that my book was "dystopian." Anyway, I have a new author page on Facebook. I might put a bit of money into promoting it. Have to say, though, the design possibilities on that page are pretty limited. I'm having more fun with a new Tumblr blog, RalfLostHisBoost. I might also put a few dollars into promoting on Goodreads, where I also have an author page (but find myself spending more time chatting with fellow readers in the Proust group). In the America of The Boost, which takes place in 58 years from now, the Chinese are pretty much running the show. Their dominance of the next stage of technology has catapaulted them to the top. That victory, which I'm planning to detail in a prequel, happens in the 2030s and '40s, when they come up with the first and best cognitive implants for the brain. These are networked supercomputers, and people who have them appear to function at a higher and more efficient level. So when the Chinese offer these chips and software to the rest of the global population, who can turn them down? To do so would relegate populations to a backward status. It might be similar to siding with the Neanderthals while the Cro-magnons are already busy making tools and covering their cave walls with fabulous art. The word for people without these chips, or "boosts, is "wild." Why would the Americans resist the Chinese chips? Lots of reasons. Whoever controls the chips also dominates the market for information, because almost all of the machines and services in our lives, from televisions and phones to computers and credit cards, move into the chip. It gobbles up and destroys other markets, much as the cell phone does today. What's more, whoever operates the chip can monitor the population, and control it with apps and software updates. 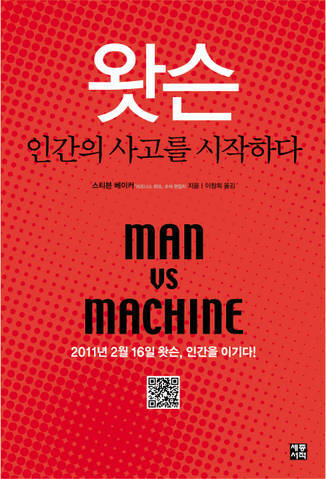 So by the time the book begins, the Americans have essentially lost the battle for control of the information economy. Those with the most power in the United States (the villains in the book) are corporate lobbyists who work closely with the Chinese. This brings me to the reason I'm writing this. I got my first review of The Boost. It's in Publishers' Weekly. And while the reviewer has some nice things to say about the book ("a strong first effort with broad appeal to readers of thrillers and Sci-Fi) s/he laments a "grating portrayal of China as an unrelentingly evil country that will stop at nothing in its quest for dominance." I certainly didn't intend that. As I see it, the Chinese role isn't all that different from what the U.S. presence must have felt like in much of the world following World War II. They have a lot of power, money and influence. They put up new buildings, export machines, and have a lot of say about the direction of local governments. In short, they advance their interests. As far as "evil" goes, most if it in the book is carried out by lobbyists and their corporate patrons. It'll be interesting to see how other reviewers read it. Anyone with a blog or publication want to see a review copy? Back in January, my wife and I drove to Best Buy and spent more than $100 on a video camera. Then we came back and fooled around with the curtains and lights in the living room, trying to create an atmosphere which would render me as something between a shadowy droopy-eyed ancient and a ghost. It wasn't easy. Finally I delivered my lines about my upcoming book, Final Jeopardy, and we sent the video out to Sheila English, CEO of Circle of Seven Productions. The next day I got an email. The lighting was bad. I was dressed too casually. I didn't deliver the lines all that well. Retake? In the end, Circle of Seven mixed a lot of other material into the trailer, and my face was reduced more much of it to the size of a postage stamp. It was all for the good. And yesterday I learned that the trailer won an award for the best book trailer of the year. Congratulations to Circle of Seven! We haven't used that video camera since its big day in January. It's sitting in my desk drawer, its mini-tripod still attached. I imagine someone will want to bronze it at some point. I'm willing to entertain offers. 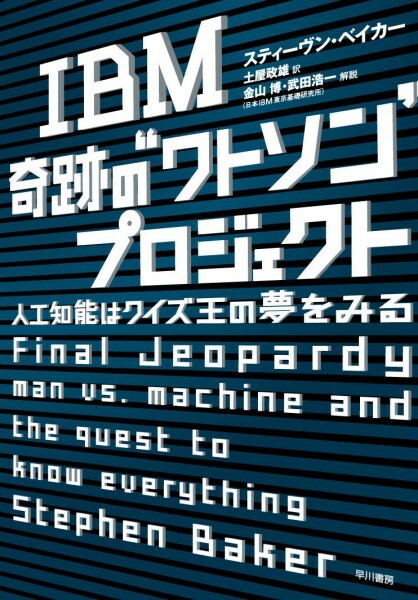 Final Jeopardy is coming out in Taiwan on August 1. It's been out for a couple of months in Korea (below), and will come out in September in Japan. I can only imagine how hard it must be to translate. 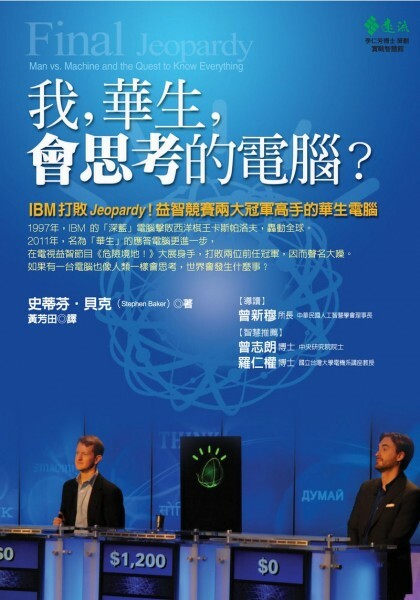 After all, much of the challenge in programming Watson had to do with teaching a computer the nuances of language, including word play and puns. Those are brutal to translate. Brad Rutter, the all-time leading money winner in Jeopardy, lost to IBM's Watson computer in February. (The match is the last chapter of the story I tell in Final Jeopardy.) A couple years ago, Brad moved from his hometown of Lancaster, Pa., to Hollywood, where he's trying to make it in television. Here's a short comedy riff featuring his recent history on the game show.